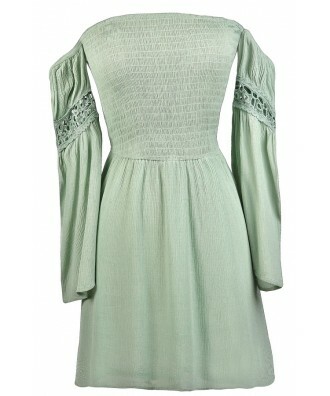 You have added Merry Maiden Off Shoulder Dress in Sage into shopping cart. This boho dress has an adorable cut with off the shoulder sleeves. The Merry Maiden Off Shoulder Dress is made of a gauzy fabric and is lined below the waist. It has gathered fabric at the bust that stretches to fit. The off the shoulder bell sleeves add to the laid-back hippie vibe, completing this look. The Merry Maiden Off Shoulder Dress is a cute dress that looks nice paired with gladiator sandals, wedges, or cowboy boots for a cute country look. Details: Lined below waist. 50% nylon, 50% cotton. Lace: 100% polyester. Lining: 100% polyester. Hand wash cold. Do not bleach. Hang or line dry. Small measurements: Length from top of bust to hemline: 28". Bust: 30". 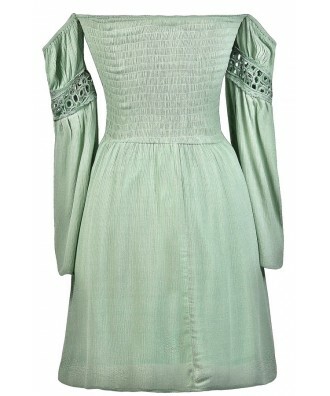 You have added Merry Maiden Off Shoulder Dress in Sage into Wishlist. You have added Merry Maiden Off Shoulder Dress in Sage for Stock Notification. 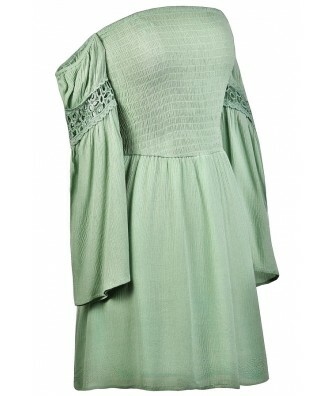 You have set Merry Maiden Off Shoulder Dress in Sage as a loved product. You have removed Merry Maiden Off Shoulder Dress in Sage as a loved product.